In this parallel cartoon universe, the Commander-in-Chief opens the White House doors for an “all access” look at a typical day in the life of the President of the United States. 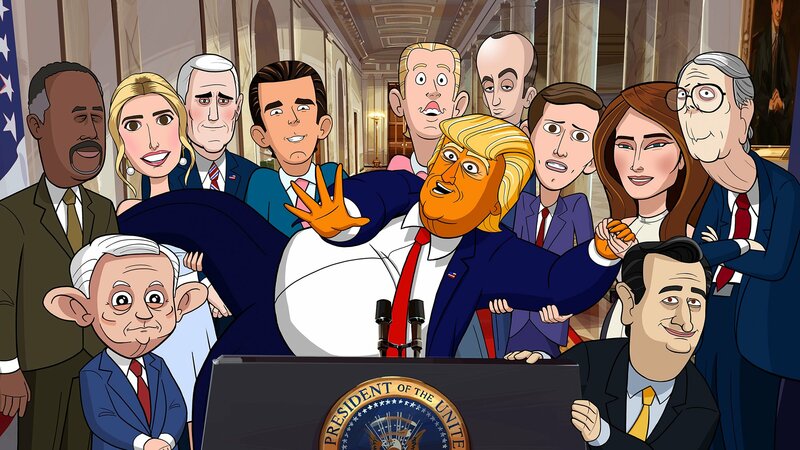 OUR CARTOON PRESIDENT examines the quintessentially Trumpian details of the presidency and his most important relationships, and no one is safe – from his close family and confidants to key political figures from both parties and members of the media. The President tries to revive his low approval ratings. The president avoids comforting disaster victims by recruiting a team of impersonators to replace him. The President sets out to reverse all of President Obama's accomplishments. The President tries to win back Ivanka Trump by supporting her progressive Paid Family Leave initiative. The President tries to outdo handsome Canadian Prime Minister Justin Trudeau at the White House's first State Dinner. The President battles with the news media after Melania rolls her eyes. The President tries to boost public perception of his dubious net worth. The President lets loose while General Kelly is out of town. The President tries to shore up his Evangelical base by embracing Christianity. The President throws out the first pitch at a Washington Nationals game. The President tries to survive the Russia investigation with Steve Mnuchin's help while Nancy Pelosi and Chuck Schumer fire up Democrats. Our Cartoon President patches up his marriage to Melania. The President struggles to keep his disloyal staff from cooperating with Robert Mueller. Our Cartoon President energizes elderly voters ahead of the midterm elections. Our Cartoon President drums up funding for the Wall. Our Cartoon President militarizes the government. Our Cartoon President learns to campaign like a traditional non-racist president. Our Cartoon President teams with his son to help Republicans win the midterm elections.